Moms and kids during a ballroom dance lesson. From social to competitive scenes, Kiwis have played an important role in dance history, especially when it comes to ballroom dancing. Can your kids groove to the music and dance like the masters? 7-year-old competing with adults during a ballroom dance competition. Is ballroom dancing for your kids? Ballroom dancing history was first recorded in the 16th Century when German social elites enjoyed the elevated form of folk dance as a recreational activity. After having been exclusive for the members of the upper strata, ballroom dancing has fast become one the world’s most favorite dance forms. The evolution of dance has brought New Zealand and other parts of the world prestigious performing arts schools, dedicated dance schools, and next-door dance studios which hone the talent and skills of dance and fitness enthusiasts through dance lessons. As parents, we are no strangers to ballroom dancing. If you are looking for a great activity that you and your kids can enjoy, ballroom dancing for kids is an excellent option for a real quality time. Considering the many benefits of dancing, parents must be aware of what toddlers and children can get if they learn ballroom dancing. Aside from developing kids motor skills, ballroom dancing lessons are also practical means to develop social and cognitive skills especially when it comes to learning a specific dance rhythm. Moreover, ballroom dancing for kids can also be a fun time for fitness! Let your kids learn to dance! If you're interested in enrolling your kids in dance school, visit ActiveActivities directory to access a long list of activities for kids, including ballroom dancing choreography and kids dance classes! You don't need to worry about age requirements since most, if not all, dance schools encourage parents to enrol their little dancers while they are young. Ballroom dancing for kids is almost a no-risk activity, so you really don't have to worry about your kids' safety. However, it would always be best if you decide to supervise or to join your kids dance classes. Don’t shy away from spectators because most parents do more than watch their kids on the dance floor! Get your kids to start ballroom dancing! Are you having trouble looking for kids activities? Ballroom dancing is a terrific start for your little energizers! You really don't need to pressure your kids to learn the waltz or salsa. All you need to do is buy them a pair of dance shoes, turn on that ballroom dancing music, and teach them a few dance steps or one ballroom dancing technique. Being a dance master doesn’t happen overnight, but if you begin your kids’ ballroom dance journey at home, there are better chances for them to be more enthusiastic about enrolling in dance classes. Do you want to know which ballroom dance your kids will enjoy? You can look for ballroom dance videos online or you can go to the mall near you to purchase ballroom dance instructional videos. It would also be a great idea to expose them to ballroom dance by watching dance recitals or competitions. Who knows? 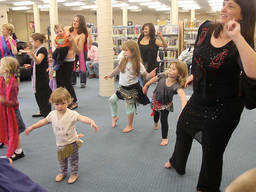 Your little ones may someday join the ranks of dance masters including Fred Astaire, Katrina Patchett, and Toni Redpath. Make ballroom dancing a family activity! Check out ActiveActivities directory to begin you and your kids’ dance journey. Whether you choose to teach them in the backyard or enrol them in professional dance studios, all they need is practise to someday get a standing ovation!